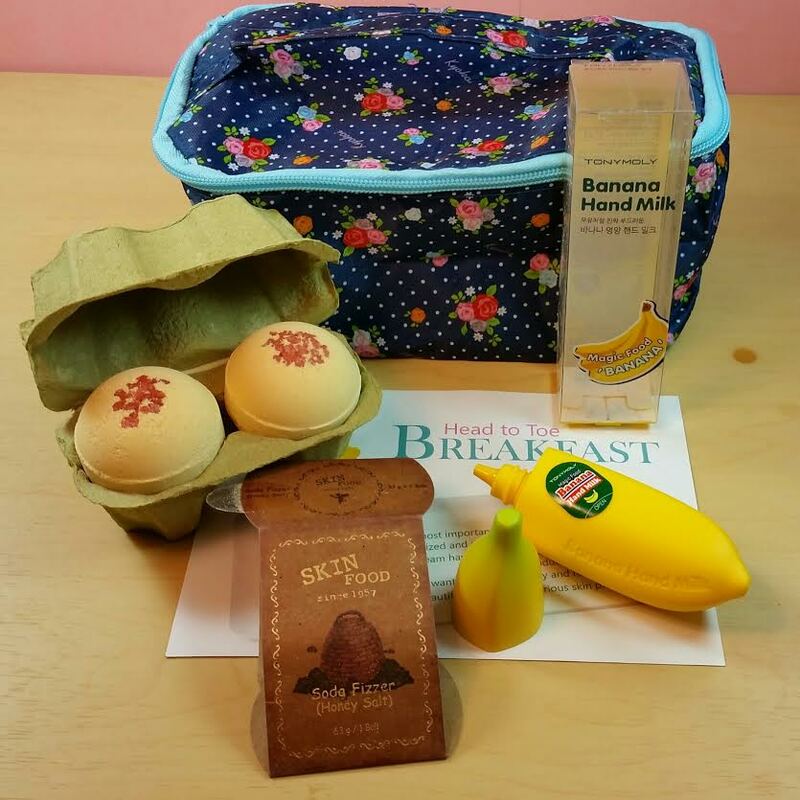 Beauteque Head to Toe Breakfast Bag Review and Coupon Code! Beauteque has a specially curated bag each month called the Head to Toe Bag. For the month of March, the theme for this bag is "Breakfast" and I'm totally loving it. 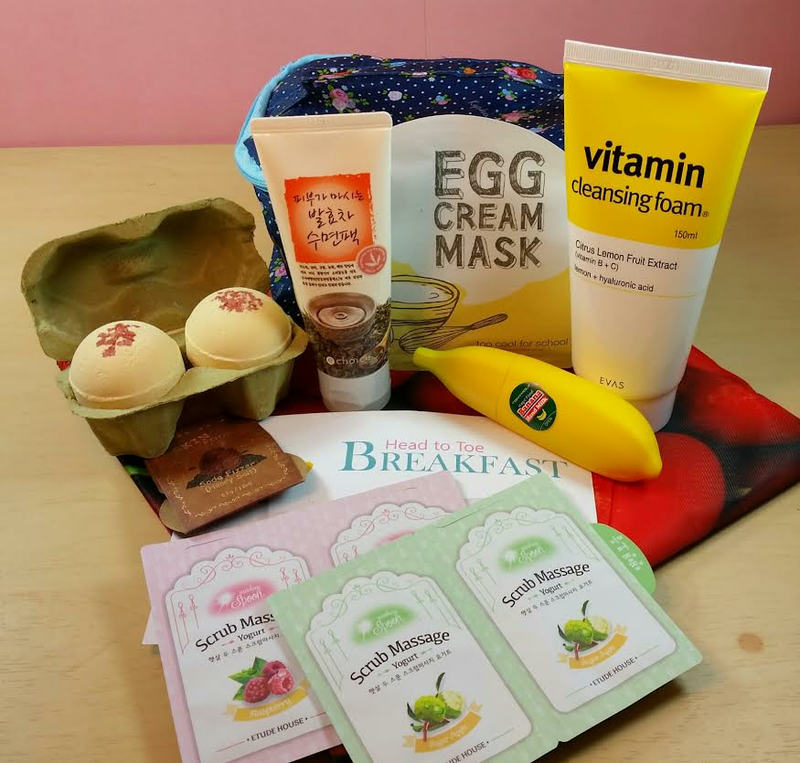 Everything in it is related to breakfast and we all know how cute some of these Asian beauty packaging can be. 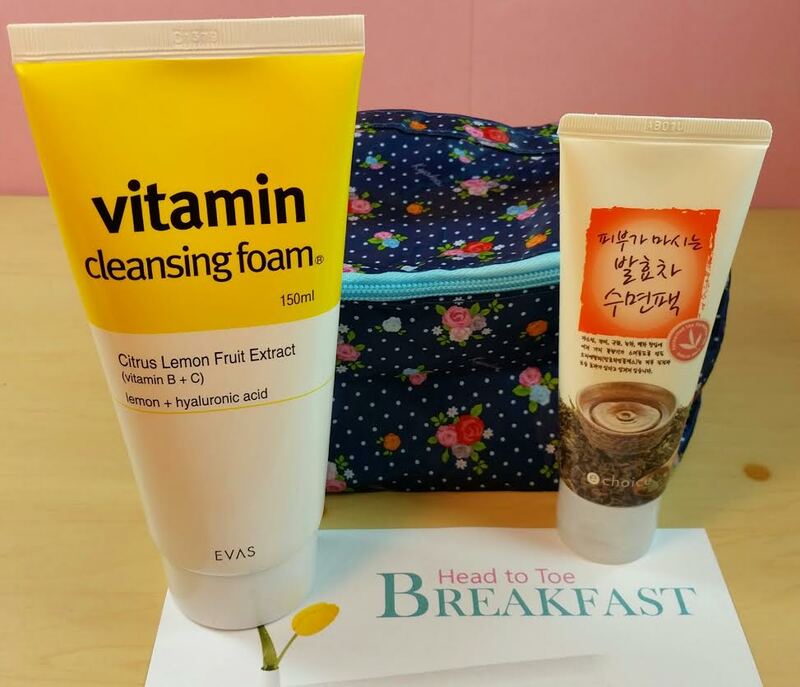 If you love kbeauty, these Head to Toe bags are a lot of fun and tend to have both interesting and staple products in them. You'll always get a nice selection and there have always been some options to personalize the contents more to your taste as well. I love the customization aspect Beauteque offers with both these Head to Toe bags AND their monthly subscription BB Bags. What You Get: Everything you see here! remove pores from your face. That's impossible. This isn't a super high quality brand in my experience but the first few ingredients do include AHA's ( glycerin, myristic acid, stearic acid, potassium hydroxide). Since this is not available for purchase on their website, I believe there may have been a packaging change or it's discontinued. eChoice From Nature Fermented Tea Sleeping Pack- This sleeping pack is ultra gentle with fermented green tea, jasmine and rose. It's a sleeping pack so it's designed to be slathered on at night before bed and washed off in the morning but you can use it as a regular moisturizer, as well. Skinfood Bath Soda Fizzer in Honey Salt- These are so adorable and come in little egg cartons! They aren't shaped like eggs, though, they're shaped like balls. These bath bombs contain sea salt and minerals and smell absolutely fantastic. You have a choice between these, Green Tea or Black Sugar. Tony Moly Magic Food Banana Hand Milk- This is (obviously) shaped just like a banana and it's squishy so you can squeeze out the delicious smelling hand cream! It smells just like banana popsicles! I just wish the scent lasted as long on my skin as their Peach hand cream does. Still, this is so super cute! Etude House Sunshine in Spoon Scrub Massage Yogurt in Raspberry and Sugar Apple- You'll have a choice between all Raspberry, all Apple or one of each. Quite honestly, the ingredients leave a lot to be desired but this is a gentle exfoliator and it smells very good. Too Cool For School Egg Cream Mask- This sheet mask will sooth and moisturize your skin. It's also supposed to minimize the appearance of pores. 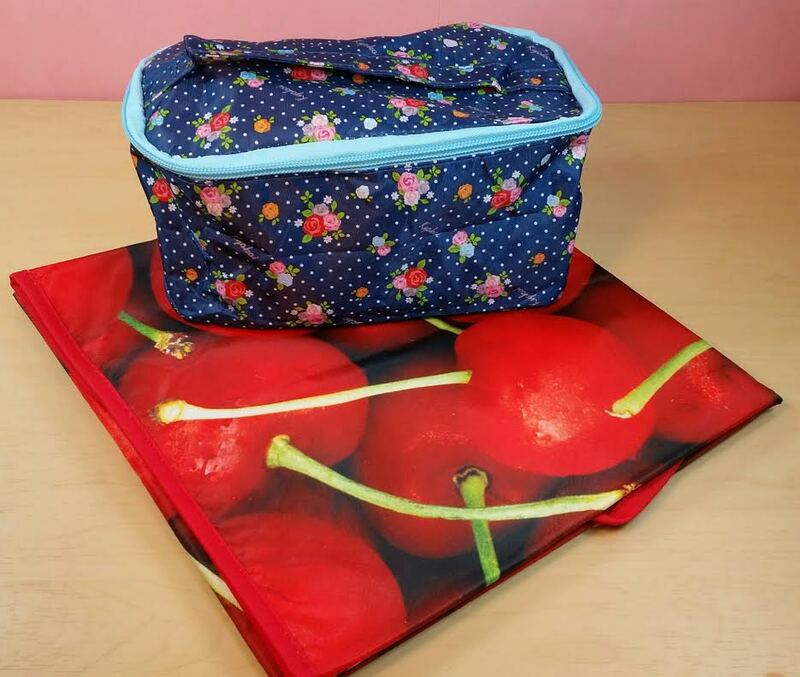 Cherry Apron- To help you make your own breakfast after you've applied your skincare breakfast to your face, Beauteque has included a cherry covered apron for you. This has got a plasticy feel so you can rinse it off nicely. It's shape reminds me of those grill aprons you see men wearing in ads. Only this has huge cherries on it! And I like the bag everything came in this month, too! VERDICT: I thought this was a great theme! And I loved getting the Tony Moly banana hand cream. 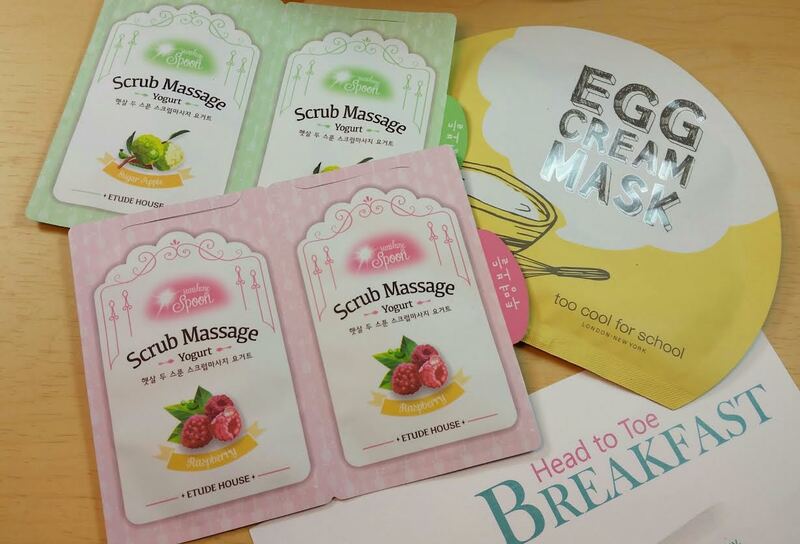 This bag had a lot of things I've never tried like the TCFS Egg Mask and the bath fizzies. The Evas Vitamin Cleanser is the only thing I'm kinda unexcited about but other than that this was a well curated bag with a super fun theme. I hope they do a "Second Breakfast" (get it!?) because there are so many other awesome food type products available. There's no way they could get them all into one bag. Not to mention that the bag everything comes in is seriously adorable. I think the Head to Toe bags are my favorite Beauteque bags. If you are not interested in a monthly subscription, you should be keeping an eye out each month for the release of these Head to Toe bags. At $26 plus shipping they're a good deal for US customers. This bag was worth over $50 so there is a benefit to getting things this way. Check out everything Beauteque has to offer at www.beauteque.com! Oh, and don't forget to enter my giveaway for the complete Hydration Essentials Bag curated by yours truly! *This bag was provided to me for review purposes. All opinions are my own, of course. OMG, the bath bombs in the little egg carton are too cute. Tee-hee! The apron is a really appealing bonus. I never wash dishes or cook anything without wearing one, so yeah. The bath bombs are so strongly scented I'm using them as an air freshener. I love them! Nice write up Sarah! I think the bath bombs in the little egg carton are so cute. The apron is a really appealing bonus.